"Some sad. Some funny. All true." "Six men enter, five men leave." "Joined Navy. Spent year with Army." "Avoid potholes. They tend to explode." "Some smells you will never forget." "Battle Captains: Responsibility without any authority." "Kids grow fast in a year." The project was inspired by Smith Magazine's popular "Six Word Memoirs" project. 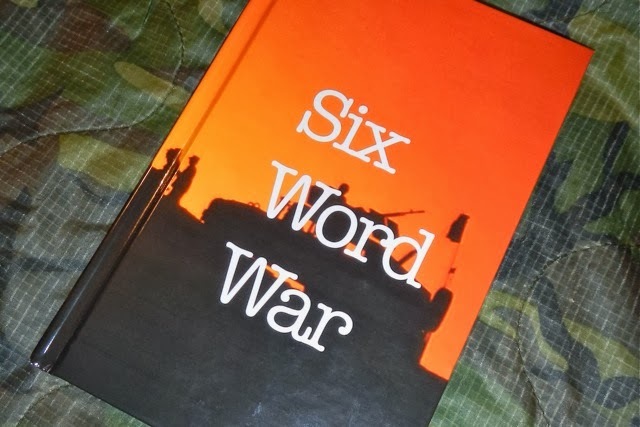 Now published after Kickstarter effort last summer, the glossy and hard-covered "Six Word War" delivers 100 pages of pithy insights, strange tales, and both good and gallows humor. There are even a few color photo illustrations. Instead of a book about Iraq or Afghanistan that tells one soldier’s perspective, Six Word War is the first ‘crowdsourced’ war memoir that will tell a story different than any other ever told about war. For the first time in history, one book will contain the collective experience of our military at war in their own words. Sometimes veterans have funny stories to tell and sometimes they’re tragic. Not every story on its own could justify an entire book, but that’s what we think is incredible about this project. The thousands of stories that we’re gathering tell the real story of Iraq and Afghanistan—a story that couldn’t possibly be told by one person. A related website continues to collect 6-word submissions here. The editors say they plan an expanded future edition. A Facebook page is here.